Though the Sparo design is a bit bolder in its appearance and isn't afraid to make its presence known, it's still effortlessly sophisticated. Wherever the Sparo goes, it will add warmth and bring light to the atmosphere. 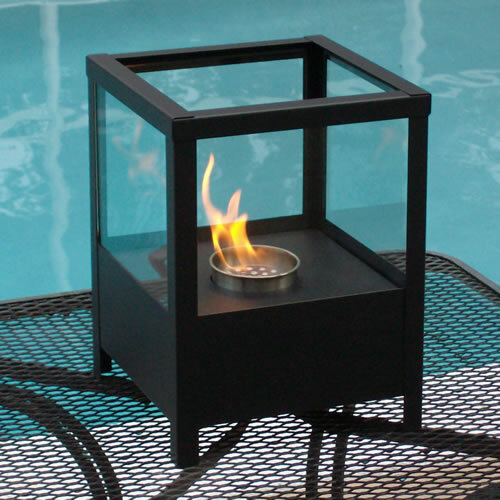 Using ethanol as its fuel, this burning lantern is perfect for either indoors or out. Simply remember not to leave this model outside for prolonged periods of time, exposed to nature's elements, so it can retain its high level of durability. Ships with snuffer. This open ultra modern design allows the beauty and colors of the flames to be enjoyed by everyone. Relax and unwind as you watch the fascinating flames. Perfect for any setting.